Steakhouse and Columbia (in Ybor City), will be full of conservative delegates. 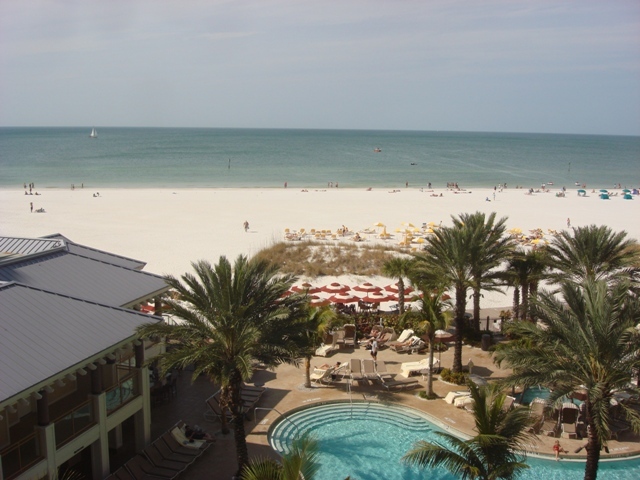 But Mitt Romney, Jeb Bush, Michigan Governor Rick Snyder, and the other GOP celebrities would do well to visit Caretta on the Gulf, which has splashed on the four-diamond scene in Clearwater Beach’s three-year old Sandpearl Resort. Major League baseball players during Spring Training and wrestler Hulk Hogan are already regulars, and Michigan State’s marching band performed a beach pep-rally right in front of the Caretta’s leading up to the Spartan football team’s New Year’s Day Outback Bowl game. Floor to ceiling windows and an outdoor veranda make for sunset dining just above the beach and looking over the Gulf of Mexico. Sushi; fried oysters; crab bisque with jalapeno shortbread; fork and knife Caesar salad; oven roasted grouper with Chinese black rice, fava beans and artichokes; or the bone-in rib-eye is one path your five-course dining adventure could take. A pathway to desert then, should you choose it, is just a few steps onto the sand beside the restaurant where you can make gourmet s’mores over a private, prepared bonfire. Beach bonfires, sunrise yoga, and swim-up evening movies at the pool are reminders that the sparkling new Sandpearl Resort is sophisticated but not snobby. Every guest check-in is scored with music from a player Steinway piano and celebrated with a complimentary glass of champagne and in the lobby, which is, at the same time, filled with large watercolor paintings of children at play by the sea or snorkeling. Spotless, soft pastel-colored guestrooms and suites look over the pool, powder sand beach, and pelicans at play in the placid gulf. Don’t look away long or you’ll miss the sight of diving dolphins. Do drift off, though, during a treatment in the Sandpearl Spa, or, pay close attention during a “Massage Lesson for Partners,” a unique and memorable opportunity offered for only $195. You can get hands-on in the kitchen, too, since Caretta on the Gulf offers cooking demonstrations with samplings of organic food and wine for $35. Sunset sailing, deep sea fishing, wave-runners, parasailing, kayaking, astronomy and other activities can be arranged, including a half-day camp for kids. Those without a car can walk the entire area for shopping, the marina, sight-seeing, the landmark Pier 60, and off-resort eateries such as Frenchy’s, which serves the ubiquitous grouper sandwich and a deep-fried Oreo for dessert. Quiet, yet entertaining Clearwater Beach is on a sandy key only 20 minute’s drive from Tampa Airport. The scenic, straight shot west is mostly over bay-splitting causeways, so you’ll “feel Florida” fast after your flight in. 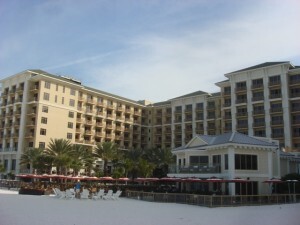 For more information, visit www.Sandpearl.com or call (877) 726-3111.